Contour Testing Strips are used in combination with a blood glucose monitoring system in order to accurately the current level of glucose in your bloodstream. The strips are used by people with diabetes and they can self-test their current blood glucose levels using the strips and monitory system. As part of a test, a small drop of blood from the patient is put on a testing strip and the connected monitoring system is able to calculate the current blood glucose level with this sample. Testing strips are a useful part of helping diabetes patients keep track of whether their blood sugar level is at the right amount or if further action is required because it is currently too high or too low. What are Contour Testing Strips? Contour Testing Strips are used as part of blood glucose testing, which is done by people with diabetes to keep their condition under control. The strips, which are small and mostly made of plastic, are used along with a blood glucose monitoring system for self-testing of current glucose levels in the bloodstream. While not everyone with diabetes will test their blood glucose levels, it is considered a useful way for patients to make more informed decisions regarding their diet and medication dosing. Testing blood glucose levels is recommended to anyone who has diabetes that is taking medication that can lead to hypoglycemia (caused by having a very low level of blood sugar). One notable example of such medication is insulin. How do Contour Testing Strips work? As part of blood glucose testing, a small needle called a lancet is used to prick your finger, drawing a drop of blood from it and applying it to a test strip like the Contour one. The test strip the blood is applied to will be inserted into a blood glucose meter. When a drop of blood is put on the right end of the test trip, it reacts with a chemical called glucose oxidase which produces gluconic acid from the glucose in the blood. At the other end of the test trip, the blood glucose meter transfers a current. The test strip itself has electric terminals that allow the meter to measure the current between the terminals. The current between the terminals on a testing strip changes depending on how much gluconic acid has been produced by the drop of blood. The blood glucose meter will use an algorithm to work out the current blood glucose level based on the difference in current. This information will be shown to the user on the blood glucose meter display screen. How do I use Contour Testing Strips? Those who use testing strips and a blood glucose meter should have a detailed user guide that will explain how exactly to use their tools and what the different information displayed on a meter’s screen means. Make sure to read your user guide and all instructions materials carefully before you begin using Contour Testing Strips and the related monitoring system. The strips are supplied in a bottle with a flip-top lid. The test strips should be kept secured in their original bottle when they are not ready to be used, because the bottle is designed to keep them dry (which is essential). Exposure to room humidity can damage these strips. These test strips are designed to easily “sip” the blood via the sample tip. Avoid dropping blood directly on the flat surface of the test strip. These test strips are for single use only, so you should use a fresh one each time you need to conduct a blood glucose testing. When you move the test strips and glucose meter to a different location, it’s recommended you give both about 20 minutes to adjust to the temperature of the area before you being a blood glucose test. How long do Contour Testing Strips last for? Contour Testing Strips and similar alternatives should have a use by date on the label of the bottle they come in and the pack the bottle came in. After opening, blood glucose test strips will usually be good to use for another 3-6 months. If you have more than one pack of test strips, then it’s wise to use up the oldest pack first. 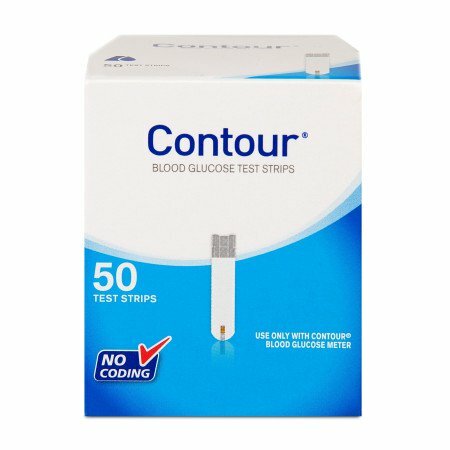 Where can I get Contour Testing Strips online? Contour Testing Strips and other blood glucose test strips can be ordered from online, but of course you’ll want such items from somewhere you know is safe and legal. At Doctor-4-U you can buy Contour Testing Strips and many other kits and treatments from our website in a safe and convenient manner. To order these testing strips online, you’ll need a prescription from a registered doctor. We have GMC registered doctors on hand who can evaluate your suitability for this product and provide a prescription in reasonable time. All you need to do is submit a medical consultation form plus relevant details. Once everything is approved, your order will be dispensed by our UK-based pharmacy and delivered via your chosen postal method.